How would you like to know how to have money take care of you? In this episode number 99, I have a guest whom I know you will love. Racheal Cook, MBA is a green smoothie enthusiast, restorative yoga advocate, and award winning business strategist who believes entrepreneurs can grow their dream business while living their dream life, right now. After experiencing debilitating anxiety and burnout in her former life in the traditional corporate world, Racheal walked away from a lucrative consulting career and onto a yoga mat. Months later, she married her passion for yoga and business acumen by launching The Yogipreneur, a boutique consultancy teaching the yoga of business and mindful marketing. Since launching she’s built two multiple six-figure businesses inspiring over 20,000 entrepreneurs around the world to create profitable, sustainable businesses they can be proud of, all while navigating the beautiful chaos of raising three kids, two kittens, and one cocker spaniel with her husband Jameson. Racheal’s parents were entrepreneurs, and were quite successful. Racheal grew up in a beautiful house on the waterfront with boats and fancy cars. Large fancy purchases were made frequently, including a 44’ yacht her father purchased for her mother who could no longer get into a sailboat. Despite this, when it came time to buy school clothes, her mother would bypass the mall, and take her to WalMart instead, and the family would not eat out often. And whenever Racheal wanted something, she had to work for it – babysitting, help out at her dad’s office, wait tables and the like. Her parents instilled in her that you had to work hard for your money, and made her walk the walk. The best money advice Racheal ever received was from her dad: “If you take care of your money, your money will take care of you”. His father taught her how to take care of money – including putting her in charge of the household checking account when she was just 15 years old and in high school. She learned really early how to manage her money. At a young age, Racheal was taught that taking risks was a natural part of being an entrepreneur. Now that she is a mother of three, Racheal admits that her willingness to take risks has to be reeled in somewhat as she has much more responsibility than she did when she was younger, and routinely explored riskier options in her life and business. The best money she has ever spent aside from buying her home would be money spent on self-development such as hiring a coach or a personal trainer. She has always seen a huge return on those types of investments. Who Manages the Family Finances? While Racheal takes care of the business finances, her husband Jameson, who works with her in her business, takes care of the household finances. They have money dates once a week and they go through both business and household finances. They use YNAB (You Need a Budget) which Racheal loves and has been such a game changer for their budgets. 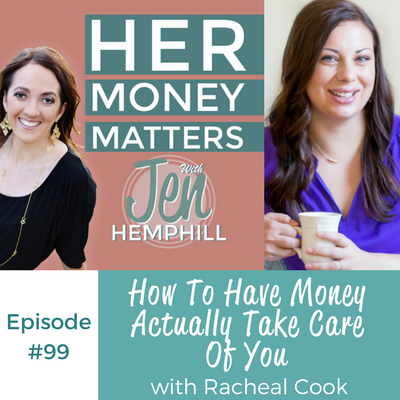 When Racheal and her husband married, her husband had little experience managing money, so Racheal took the reigns. There were difficult times where they brought in a financial expert to bridge the gaps between them, and learn to work together. They make sure that when they have the big conversations, they bring in their CPA to help. With her children, Racheal insists that when they receive money for birthdays or Christmas, she brings them to the bank and they deposit half into their account, and they can use the other half to spend on whatever they want. She also encourages the children’s grandparents to deposit money into the children’s college account instead of buying them a lot of toys. To everyone who participated in my first weekly FB Live in our community. We discussed how to choose when to saving and paying off debt. I’ll put a direct link in the comments in case you are interested. A big thank you to Shannon, Stephanie, Randi, Heather, Roslyn, Brittany, Vanessa, Randi, Alesha, Whitney, Jennifer for being there and their input! We’ll be celebrating 100 episodes! I’ve got a special announcement next week because we’ve got so much to celebrate, Mother’s Day, Military spouse Appreciation Day, Memorial Day, and it’s my birthday month. I will explain my special announcement and how it’s going to work. I will also share some highlights from you the listener and what has happened along in my journey as well. Plus, If you love this episode and you are listening from your smartphone, look for the 3 dots click on them and it gives you the option to share via text, social media, email. However you want to do it. I’d appreciate it as it will not only help this podcast continue to grow but you will be helping a friend! So do it now while you are thinking about it.